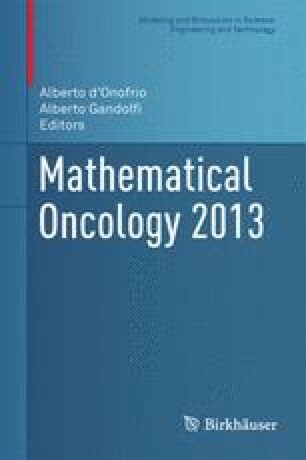 We review mathematical models of tumor growth based on conservation laws in the full system of cells and interstitial liquid. First we deal with tumor cords evolving in axisymmetric geometry, where cells motion is simply passive and compatible with the saturation condition. The model is characterized by the presence of free boundaries with constraints driving the free boundary conditions, which in our opinion are particularly important, especially in the presence of treatments. Then a tumor spheroid is considered in the framework of the so-called two-fluid scheme. In a multicellular spheroid, on the appearance of a fully degraded necrotic core, the analysis of mechanical stresses becomes necessary to determine the motion via momentum balance, requiring the specification of the constitutive law for the “cell fluid.” We have chosen a Bingham-type law that presents considerable difficulties because of the presence of a yield stress, particularly with reference to the determination of an asymptotic configuration. Finally, we report some recent PDE-based models addressing complex processes in multicomponent tumors, more oriented to clinical practice.